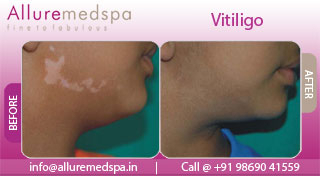 Vitiligo is a condition in which white patches develop on the skin. Any location on the body can be affected and most people with vitiligo have white patches on many areas of the body. Melanin is the pigment that gives the skin its characteristic color. Vitiligo is caused by a loss of pigment in the skin, due to destruction of pigment-forming cells known as melanocytes. The exact cause of the destruction of these cells is not known. One possible explanation might be that the body's immune system destroys the cells, as in other autoimmune conditions. Although vitiligo affects all races equally, it is more noticeable in dark-skinned people. 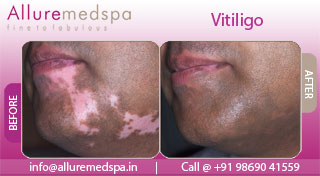 Symptoms of vitiligo include an often rapid pigment loss on several areas of the skin. The initial appearance of the white patches can be followed by a stable period without any progression of the condition. Later on, further cycles of pigment loss and stability may be observed. Vitiligo commonly affects areas on the skin that are exposed to sun, body folds (such as armpits), previous sites of injury, areas around moles, or areas around body openings. It is rare for pigment to return once the white patches have developed. Vitiligo can also affect the eyelids and hair. Three myths about the treatment of vitiligo prevail in the medical profession. The first myth is that treatment of vitiligo is "impossible." This is clearly not true and the majority of patients can achieve good results. The second myth is that oral psoralens, which form the basis for some vitiligo treatments are "toxic to the liver." Oral psoralens are not toxic to the liver. The third myth is that psoralen + UVA (PUVA) treatments for vitiligo "cause cancer of the skin." When used to treat vitiligo, PUVA therapy requires only a limited number of treatments-approximately 150 in number that has not been shown to cause skin cancer. By comparison, PUVA treatments for psoriasis can be as many as double the number for vitiligo. It has been shown that a small percentage of patients who receive more than 250 PUVA treatments can develop treatable squamous cell cancers of the skin. For many, vitiligo is not just a cosmetic problem-it is a major social dysfunction that seriously curtails their ability to lead a normal work, social or married life. Reversal of the white spots and restoration of normal skin color is therefore the primary hope for all these disfigured vitiligo patients. Four options are currently available for the treatment of vitiligo: sunscreens; cover-up; restoration of normal skin color; and bleaching of normal skin with topical creams to remove normal skin pigment to make an even color. The two goals of sunscreen treatments are: to protect unpigmented involved skin from sunburn reaction and to limit the tanning of normal pigmented skin. The sun protection factor (SPF) of sunscreens should be no less than SPF 30, as this grade blocks not only erythema, but also the affects of sunlight on the DNA of the skin cells. Sunscreen treatment skin phototypes 1, 2, and sometimes 3 (those who burn, then tan to some degree). 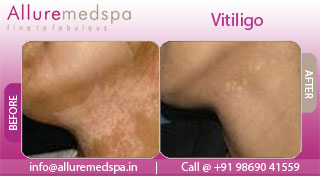 The goal of cover-up with dyes or make-up is to hide the white macules so that the vitiligo is less visible. Self-tanning lotions and camouflage are quite helpful for some patients. Restoration of normal skin color can take the form of spot treatments or whole body treatment. Initial treatment with certain topical corticosteroid creams is practical, simple, and safe. If there is no response in 2 months, it is unlikely to be effective. Physician monitoring every 2 months for signs of early steroid atrophy (thinning of the skin) is required. Much more complicated is the use of topical Oxsoralen (8-MOP). Oxsoralen is highly phototoxic (likely to cause a sunburn), and the phototoxicity lasts for 3 days or more. This should be performed only as an office procedure, only for small spots, and only by experienced physicians on well-informed patients. As with oral psoralens, 15 or more treatments may be required to initiate a response, and 100 or more to finish. Mini grafting, which involves transplanting the patient's normal skin to vitiligo affected areas, may be a useful technique for refractory segmental vitiligo macules. PUVA may be required following the procedure to unify the color between the graft sites. The demonstrated occurrence of Koebnerization in donor sites in generalized vitiligo restricts this procedure to patients who have limited skin areas at risk for vitiligo. "Pebbling" of grafted site may occur. The goal of depigmentation is to unify skin color in patients with vitiligo virtually all over the body and those who have failed PUVA, who cannot use PUVA, or who reject the PUVA option. Bleaching with monobenzylether of hydroquinone 20% cream (Benoquin) is a permanent, irreversible process. Since application of Benoquin may be associated with distant depigmentation, Benoquin cannot be used to selectively to bleach certain areas of normal pigmentation, because there is a real likelihood that new and distant white macules will develop over the months of use. Bleaching with Benoquin normally requires twice-daily possible side effects. Uncommonly, contact dermatitis is observed. The success rate is about 93%. Periodically following sun exposure, an occasional patient will observe focal repigmentation, which will require a month or so of local use of Benoquin to reverse. 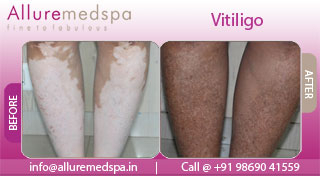 The end-stage color of skin bleached with Benoquin is the same chalk-white as the vitiligo macules. Most patients are quite satisfied with uniformity and the finality of the results. An occasional patient may wish to take 30 to 60 mg beta-carotene to impart on off-white color to the skin. The only side effect of beta-carotene is the uncommon risk of diarrhea. Patients who undergo bleaching are at risk for sunburn. They should avoid midday sun exposure and should use a high-SPF sunscreen. To date no long-term untoward effects have been reported from the use of monobenzylether of hydroquinone for skin bleaching. Allure MedSpa is a highly advanced surgical facility designed to facilitate a wide range of cosmetic, reconstructive and skin treatment needs. We ensure that patients have all the resources necessary to make informed decisions about their health and appearance. No matter what scale your weight-loss and cosmetic goals, Dr. Milan Doshi and his staff treat each case with an extraordinary level of dedication and attention to detail. Apart from grafting, anesthesia might not be required for any other procedure to treat vitiligo. The rest and recovery in vitiligo depends on the mode of treatment opted for. Allure MedSpa which is renowned for its state-of-the-art internationally acclaimed services,offers affordable and cost effective Vitiligo and cosmetic contouring procedures. To know more about the cost of your Vitiligo procedure request a consult by filling the form below.Your consultation is your chance to ask questions about Vitiligo treatment options and put your mind at rest. The decision to undergo vitiligo treatment is purely a personal one. Of course, our trained doctors will guide you at every step and recommend the best option once you come to Allure MedSpa. Our comprehensive aftercare program focuses on your unique, individual needs. A nurse, dietitian and fitness advisor work with you to provide all the help, support and expert advice and aftercare plan specific to you. Patient preparations depends on the treatment to be undergone. Once that is decided your doctor will give you the list of required preparations. The healing process is gradual, so you should expect to wait a while before fully enjoying the results of your procedure. 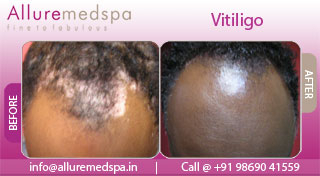 The results of vitiligo treatment depend on a lot of factors like hormones, exposure to sun and the age of the patient.